The Chelsea manager is adamant his star striker’s altercations with were not motivated by malice. JOSE MOURINHO LAST night insisted Diego Costa’s apparent stamps on Emre Can and Martin Skrtel were “absolutely accidental” before turning his anger towards an unnamed Sky Sports pundit he claims is waging a campaign against Chelsea. Costa sparked controversy during the Blues’ hard-fought 1-0 win over Liverpool in Tuesday’s League Cup semi-final second leg at Stamford Bridge by appearing to deliberately stamp on two Reds players in separate incidents without being punished by referee Michael Oliver, and may yet face retrospective action from the Football Association. But after the match Mourinho defended his star striker and suggested the accusations were motivated by a pundit that he believes has an agenda against Chelsea and Costa. “I don’t know what you mean by stamp,” he insisted. “I think maybe you are already influenced by the campaign on television with certain pundits who say Diego Costa ‘crimes’. This guy must be nuts. “I saw the incidents. About the penalty [when Costa appeared to be felled by Skrtel] I won’t speak, if I comment on that I will be in trouble [with the FA]. “What you call stamps and Sky call ‘crimes’, I have to say it’s absolutely accidental. He chases the ball, he has contact when he’s looking to the ball. When pressed to reveal the identity of the pundit that had attracted his ire, Mourinho responded: “When I see his name, I switch off the television. Email “Jose Mourinho is not happy with a certain Sky Sports pundit”. 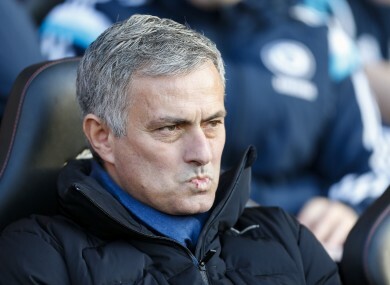 Feedback on “Jose Mourinho is not happy with a certain Sky Sports pundit”.